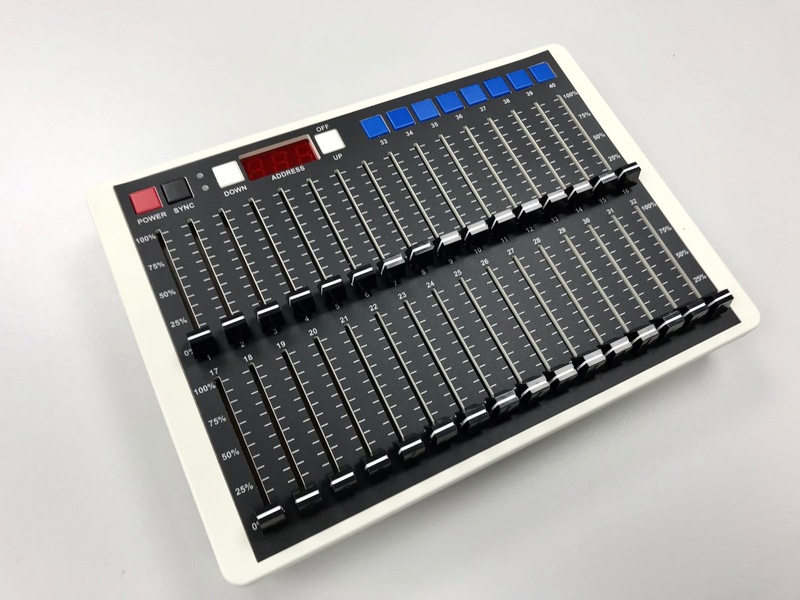 Following the success of our standard radio desk transmitter which provides easy and portable control of 8 channels, we were asked to develop a desk with the same features but more channels… Introducing the 40 radio desk transmitter. There are 40 channels available with 32 sliders, and 8 flash buttons. Each slider provides a channel of easy access and real-time control. With a manual interface, Lumen Radio technology inside, it takes just 5 AA batteries to run for over 24 hours. The unit works well with the LV4 & LV4 Pro. This TrueLED product is our standard configuration. There are no limits to how we can manipulate or develop the specifications to your needs through EMP Designs. Please contact us to discuss.